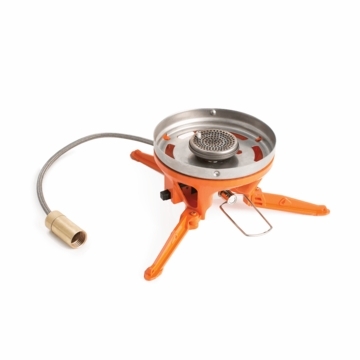 Compliment your Genesis System with a side burner that can quickly boil water for fast food and drinks. Attaches to the Genesis and Eureka! Spire/Spire LX stoves ​via the JetLink™ fuel output port which is designed to provide fuel to JetLink™ compatible stoves and accessories without the need for additional fuel sources and regulators. Boil Time: 2 minutes 15 sec. per 16 oz.